PLYMOUTH, England (LOG NEWS SERVICE) — With the second event in the America’s Cup World Series in Plymouth complete, attention now shifts to the third and final series races of the year — in San Diego, Nov. 12-20.At Plymouth, San Francisco-based Oracle Racing’s Jimmy Spithill took first place in the Fleet Racing Championship with 10 points — skippering one of the two Oracle Racing entries. Although it finished second at Plymouth with nine points, Emirates Team New Zealand skippered by Dean Barker is the leader in the combined overall standings after the two World Series events. Barker had finished second to Oracle Racing’s Spithill in the match racing championship at the first America’s Cup World Series stop in Cascais, Portugal in August. The America’s Cup World Series is being sailed this year and next in 45-foot catamarans with wing sails, as a buildup to the Louis Vuitton Cup and the 34th America’s Cup, which is scheduled to be sailed in 72-foot catamarans on San Francisco Bay, Sept. 7-22, 2013. The cargo ship HR Constitution — loaded with the AC 45 race boats, 102 shipping containers, 20 support boats and one of the cranes used to hoist the AC45s in and out of the water — is scheduled to arrive in San Diego Oct. 24. “We plan to be up and running in San Diego by the end of October and ready for the teams to sailing by Nov. 8,” said Peter Ansell, director of on-shore operations. As in Plymouth, where officials estimate more than 115,000 took in the action from up on the Hoe, racing in San Diego will be tucked in close to shore, allowing for a “stadium sailing” experience for the race crews and spectators alike. “San Diego is going to be a fantastic place: a harbor laid out perfectly, like Plymouth,” said Oracle Racing skipper Russell Coutts, who won the America’s Cup in San Diego in 1995. “When San Diego hosted three America’s Cups (1988, 1992 and 1995), the racing was a long way out to sea. That won’t be the case this time. This is going to be a great event,” Coutts said. According to officials, practice racing is scheduled to begin Nov.12-13, with the San Diego Match Racing Championship running Nov. 16-19 and the climax event — the Fleet Racing Championship — set for Nov. 20. Live coverage of racing is expected to begin Nov. 16, officials said. Trailing Team New Zealand, which leads in the combined overall standing with 38 points, are: Oracle Racing’s entry skippered by Spithill with 34 points, Oracle Racing’s other entry skippered by Coutts, with 28; Artemis Racing, with 28; Team Korea, with 26; Aleph, with 18; Energy Team, with 18; Green Comm Racing, with 17; and China Team, trailing the pack with 13. Royal Swedish Yacht Club, representing Artemis Racing, became the Challenger of Record May 17 because it was the second challenger to enter behind Club Nautico di Roma, which formally withdrew from the regatta May 17. 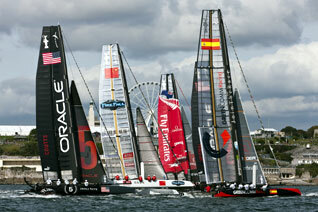 Oracle Racing, originally named BMW Oracle Racing, is represented by San Francisco’s Golden Gate Yacht Club. Larry Ellison’s Oracle Racing team wrestled the cup from Swiss defender Alinghi, backed by Ernesto Bertarelli, in 2010, in an unusual two-boat race at Valencia, Spain. At times, the 2010 Cup race pitting Ellison’s Oracle Racing against Bertarelli’s Alinghi seemed more like a TV court battle between the two men than a traditional duel between teams on the water.